Unbeatable self defense! This sturdy, yet compact, metal bat with led flashlight can give and take a beating. This is a new take on an old concept brought to you by Streetwise. For many years metal flashlights (like the Maglite) would do double duty as a striking tool (bludgeon, nightstick, etc.). Now this beauty combines a tough, bright 200 lumen led flashlight in the end of an aluminum bat you can swing with power and ease to defend yourself. The flashlight is brighter than needed to blind or startle your attacker and the bat will allow you to deliver the winning blow no matter how un-athletic you are. Anyone can swing a bat and make it hurt. Furthermore, if you are seen walking along with bat in hand, who is going to want to mess with you? Most will just look for an easier target down the road. 200 lumen flashlight shines over 600 feet, run time is 8 hours at high or 20 hours at low (380 Lumens in rechargeable model) Weather Resistant (IP64 Rating) CREE XRE LED Impact Resistant 3 position light: Max, half, and strobe for self defense Knurled grip Weights about 18 oz. (much lighter in weight than a comparable Maglight with a much smaller grip of only about3/4 of an inch in diameter. Identify Threat: An attacker will use the cover of darkness to sneak up on their victims and to hide their identity. He'll also look for the most vulnerable victim. This powerful light beam shined in the direction of a possible attacker is often enough to persuade him to go in search of an easier target. Disorient Attacker: Shining a light of at least 120 lumens directly into someone's eyes will cause several seconds of disorientation and impaired vision. The Heavy Hitter boasts a super bright 200 lumen light beam with Self Defense Strobe that can disorient your attacker and give you time to flee. Strike: If these first two are not enough to deter the attacker then a blow from the Heavy Hitter certainly will! Just step toward your attacker and swing for "de-fense"! It's one strike and they're out! 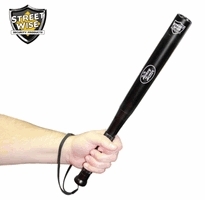 The 16 inch long bat and the length of your arm will keep you a safe distance away from the attacker and provide you with a long "strike zone". New Model Rechargeable with Charger, Adjustable Zoom Beam and 2 18650 Batteries included. This new model is improved in a number of key features over the original and yet it costs the same (for now). Rubberized grip with raised sections for best retention. No holster, old holster does not fit this item.